For the Due South character, see Stanley Kowalski. For the wrestler, see Stan Kowalski. 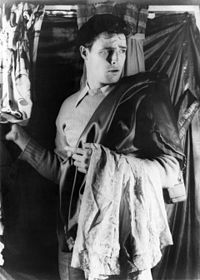 Marlon Brando as Stanley Kowalski from the stage version of A Streetcar Named Desire (1948). Stanley lives in the working-class Faubourg Marigny neighborhood of New Orleans with his wife, Stella (born as Dubois), and is employed as a factory parts salesman. He was an Army engineer in World War II, having served as a Master Sergeant. He has a vicious temper, and fights often with his wife, leading to instances of domestic violence. Near the beginning of the play, Stanley announces that Stella is pregnant. Stanley's life becomes more complicated when Stella's sister Blanche shows up at their door for a seemingly indefinite "visit". He resents the aristocratic Blanche, who derides him as an "ape", and often calls him a Polack. His resentment intensifies when Blanche starts dating his friend, Mitch, and lets Stella briefly take refuge with her after an argument in which he hits her. Stanley starts asking questions of a street merchant who knew Blanche in her old life, and finds out that Blanche is staying with the Kowalskis because she is homeless; her family's ancestral mansion, Belle Reve, has been mortgaged. He also learns that she was paid to leave Mississippi to quell gossip about her many affairs, which she began after her husband, a closeted homosexual, committed suicide. Overjoyed to have the upper hand, Stanley tells Mitch about Blanche's past, which scares Mitch into ending the relationship. The night that Stella gives birth to their son, Stanley goes out and gets drunk in celebration, and returns home; there, he finds a similarly drunk Blanche, lost in fantasies of better times. He makes a crude, drunken pass at her, which she rebuffs. Enraged, Stanley overpowers and rapes her. This final assault on what she had left of her dignity sends Blanche over the edge into a nervous breakdown. Weeks later, Stella has Blanche committed to a mental institution at Stanley's insistence. In the original play, Stella refuses to believe Blanche and stays with Stanley; in the 1951 film adaptation and many stagings of the play, however, she leaves him and takes their child. He was most famously portrayed by Marlon Brando in the play's initial Broadway performance as well as the 1951 film adaptation. Since then he has been played by Treat Williams in the 1984 TV movie and by Alec Baldwin in the 1995 TV movie. ^ Mel Gussow (1988-03-14). "Critic's Notebook; Has Stanley Kowalski Become an Unactable Role?". The New York Times. Retrieved 2014-04-30. ^ Frank Rich (1992-04-13). "Review/Theater: A Streetcar Named Desire; Alec Baldwin Does Battle With the Ghosts". The New York Times. Retrieved 2014-04-30.